When it comes to fall fruit, pears always take a backseat to apples in terms of popularity. Whenever I go grocery shopping this time of year, I always pick up some Honeycrisp apples for myself, rarely giving the pears a second glance. But every time I do end up getting pears, I remember how much I love them and wonder why I don’t buy them more often. Pears are delicious! Usually when I have pears on hand, I eat them with some almond butter or a slice of good cheese, but once in a while, I’ll poach them. Poached pears look fancy and complicated, but you’re really just simmering the pears on the stovetop — easy! Wine is a common poaching liquid, but a simple mixture of water, honey, a split vanilla bean and spices is my favorite method when I’m poaching a pear for myself. Nothing fancy! Another option for poaching your pears is using tea. And chai is my favorite because all the spices are already in the tea. These Chai Poached Pears take a little time to make, but that time is mostly hands-off — letting the pears gently simmer in the chai until they’re tender and then letting the poaching liquid boil until thick and syrupy. They’re a dessert that looks impressive, so they’re perfect for serving to dinner guests (you’ll want to double or triple the recipe, of course), but they’re not so labor-intensive that you’d only make them for special occasions. So, basically, they’re the best kind of dessert. This January, we’re republishing updated recipes from Oh My Veggies’ first year. This post was originally published on March 6, 2011. These Chai Poached Pears make an elegant dessert with minimal effort — almost all of the cook time is hands-off. 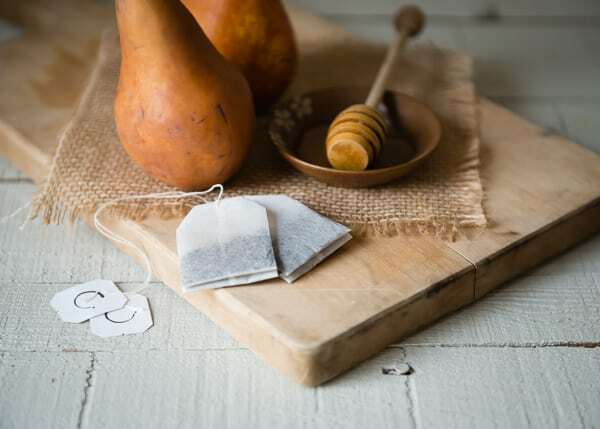 Place the chai tea bags into a 3-quart pan and pour the boiling water over the top. Let the bags steep for 8-10 minutes. Remove the tea bags, squeezing them to release as much liquid as possible. Stir in the honey. Add the pears and add enough water to barely cover, then bring to a simmer. Cook for 20-25 minutes, or until the pears are tender. Remove the pears with slotted spoon and set aside. Bring the poaching liquid to a rolling boil. Let boil until syrupy, about 20-30 minutes. To make the whipped cream, pour the heavy cream in a mixing bowl and add the sugar and cinnamon. Beat with a whisk or hand mixer until soft peaks form. Place pears in a shallow dish or bowl. Spoon some of the warm poaching syrup over the pears and add a spoonful of cinnamon whipped cream on the side. Serve immediately. This recipe sounds amazing, I love cinnamon! YUM, I will be trying this! This looks so yummy. I love chai!!! Oh I love pears – and the chai tea would be an awesome pairing! I will certainly have to make these! Oh I am definitely making this! Dessert, breakfast, afternoon snack…I’ll take it anytime of the day! What kind of Chai tea did you use? What a gorgeous looking dessert Kiersten, so elegant! 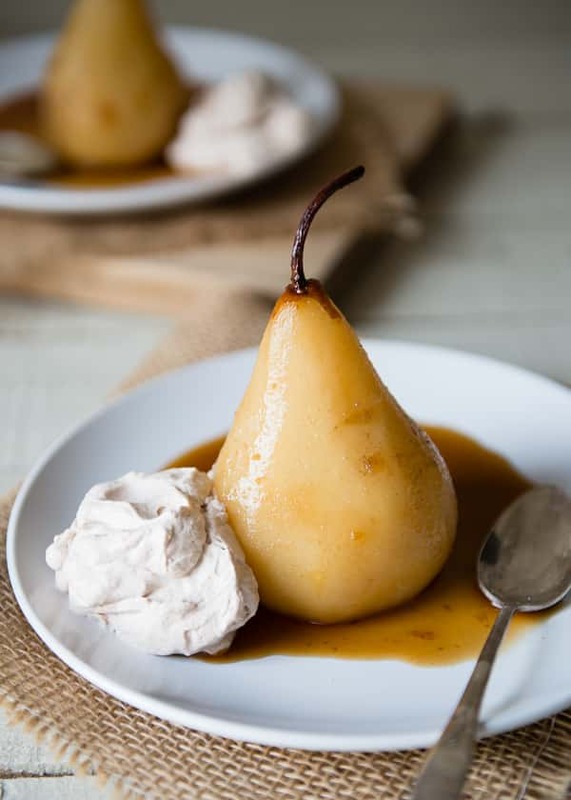 Gorgeous pears, love the chai flavors and cinnamon whipped cream! i added two more tea bags, and the seeds from one vanilla bean. after the syrup cooked down and was cooled slightly i added a pat of butter. then reheated it to a bubbling boil and used corn starch to thicken it just slightly. this is going to be dessert tonight. pears are poached already and it should be delish! Simply mouthwatering! Wow! I’m so sharing a link to this recipe in my weekly CSA newsletter!